after much thought and deliberation for all the contestants, i have to cast my first vote for ralphie, he is just too adorable and i am a jif person but won't hold that against him! lol here is to you ralphie, the best of luck you are super cute! How could I not vote for something this cute named Ralphie! He deserves his treats! So cute!!! too cute to pass on, guess you ended up winning my heart after all. having surgery friday will hang in there with you as long as i can. wish you luck! Ralphie's mommy voting for her boy! got to love this one. need milk? cute and cuddley, can i have him? hey, mmm can you share that peanut butter with me, please...lol could not resist he looks like he is enjoying it so much! stay cute Ralphie! this handsome little guy, is he dachshund hound dog mix? Giving some love to my Bassett hound baby! As this dog is my only grandson, I am of course very proud of him! we are off on vacation so wanted to give this sweet little boy one more vote + good luck! cute cute cute, a friend asked me to stop by and vote for this little guy. love the idea, cute contest. wow you are so c u t e ! Ralphie is the cutest of all! : ) My vote is for this one. Adorable. 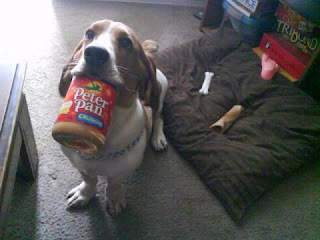 I know that peanut butter jar in the mouth look well. still love this peanut butter boy! I would like to return this jar of "Peter Pan" for a jar of "Jif". I am not only cute, I have good taste! loving you ralphie you little peanut butter eater! ralphie ralphie hes our man (dog) you can do it! Aww he's such a good boy. you and your peanut butter could sit at my table any day your are too cute!! Thanks to the dedicated voters for my p nutty boy. One last vote. you were not kidding this little guy is adorable! so happy i got a vote in! Thanks again to all who voted!! I'm happy I got to share a little bit of my puppies antics with u.